At some point in 1976 while Jim was living in London to shoot The Muppet Show, he encountered a book of fantasy art by a group of British illustrators called Once Upon A Time. 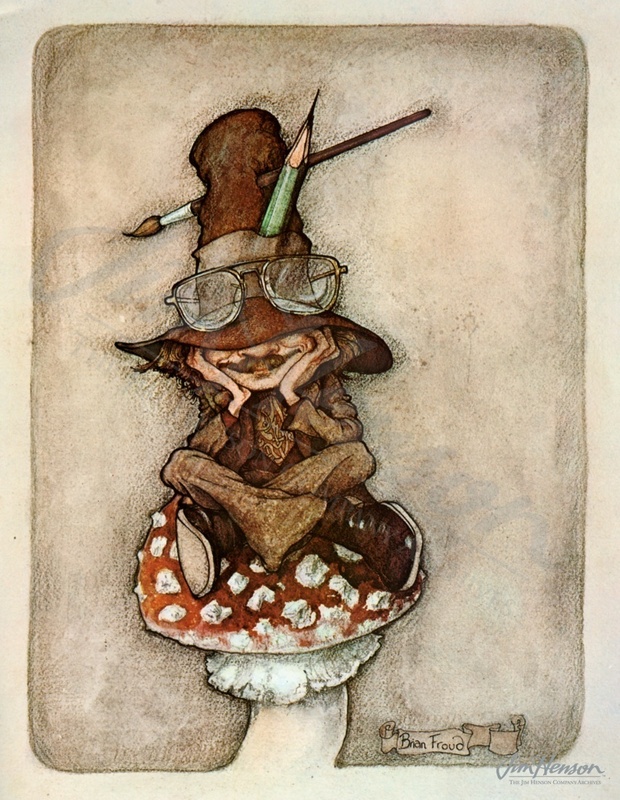 The cover image of a gentle looking creature by a waterfall was by a young artist named Brian Froud. The following year, Jim acquired a copy of Froud’s book, The Land of Froud, and asked someone from his office to go out to Froud’s home in Chagford and suggest his talking to Jim about a collaboration. Froud was interested and by August, he had made a deal with Jim to collaborate on a fantasy film. Froud relocated to New York at the start of 1978 to begin development on what would become The Dark Crystal. Together, he and Jim hoped to invent an entire world, with singing mountains, animal-like plants, and an array of mysterious species. Jim hosted a series of meetings with his creative team, brought in doll maker Wendy Midener to work with Froud in translating his designs to 3-D, and began thinking about what sort of story he could set in the world they were creating. After a year of development, Jim purchased a building in Hampstead, London to house his “creature shop” for the film and the team moved across the Atlantic. Learn about Jim’s first encounter with Wendy Midener who would be central to helping Froud create the characters for The Dark Crystal and would become Froud’s wife and lifetime creative partner. Brian Froud’s self-portrait from The Land of Froud, 1977. This entry was posted in 01-January '78, 1978, Dark Crystal and tagged Brian Froud, The Dark Crystal, Wendy Midener. Bookmark the permalink.